Base class for brick meshes (meshes made of 3D brick elements). Definition at line 197 of file brick_mesh.h. Definition at line 203 of file brick_mesh.h. Definition at line 207 of file brick_mesh.h. Definition at line 219 of file brick_mesh.h. Definition at line 223 of file brick_mesh.h. Referenced by oomph::EighthSphereMesh< ELEMENT >::EighthSphereMesh(), oomph::QuarterTubeMesh< ELEMENT >::QuarterTubeMesh(), and oomph::TubeMesh< ELEMENT >::TubeMesh(). Definition at line 58 of file brick_mesh.cc. 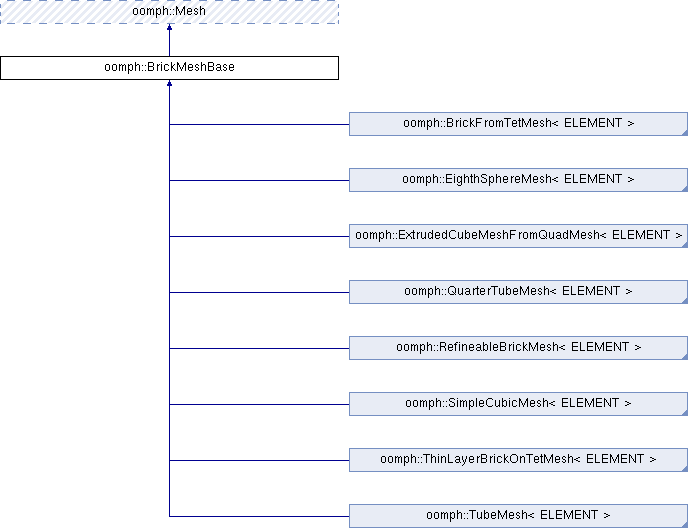 References oomph::Mesh::Boundary_element_pt, oomph::LeakCheckNames::doc(), e, oomph::Mesh::Face_index_at_boundary, oomph::Mesh::finite_element_pt(), oomph::Node::get_boundaries_pt(), i, oomph::Mesh::Lookup_for_elements_next_boundary_is_setup, oomph::Mesh::nboundary(), oomph::Mesh::nelement(), oomph::FiniteElement::nnode_1d(), and oomph::FiniteElement::node_pt().